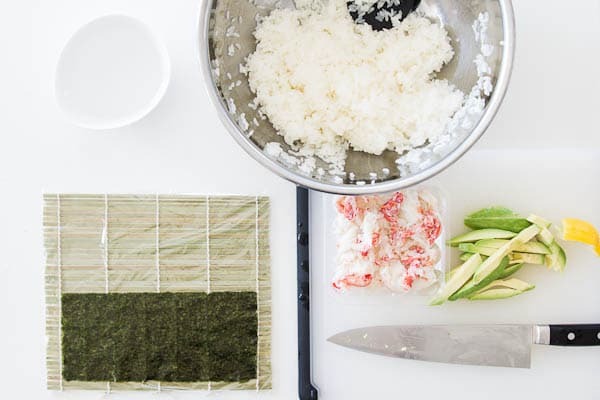 My secret to making the best California Roll, filled with savory crab and creamy avocado. Learn how, with step by step photos. I tend to categorize American sushi restaurants into two buckets: traditional places where you can get a wide selection of fresh nigiri sushi, and the non-traditional places that have pages upon pages of inventive makisushi. If I had to choose between the two, I’d take the one with the stoic Japanese dude forming little pillows of rice with a thin slice of aquatic bliss on top, but that’s not to say I don’t enjoy the raucous places with frat boys slinging sake bombs, phonebook sized menus, and of course the California Roll. 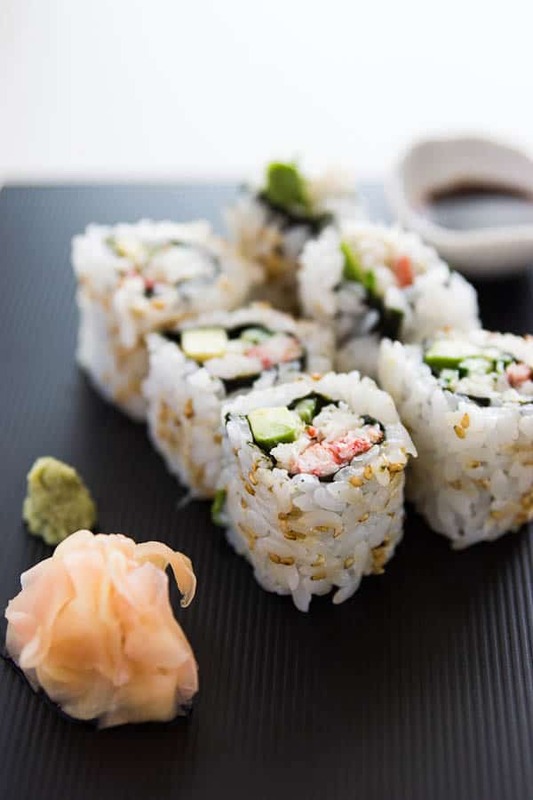 As the name implies, California Rolls were invented in the late 1960’s by a creative sushi chef in Los Angeles. Lamenting the lack of sushi grade fish in the US he decided to turn to ingredients that were readily available for his new creation. The avocado approximates the rich creaminess of toro (tuna belly), while the use of crab is a nod to the abundance of Dungeness Crab along the left coast. 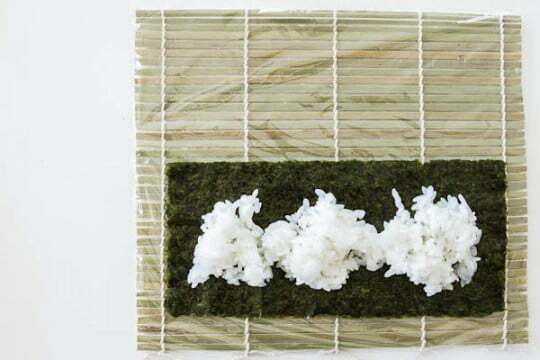 Rolling the rice on the outside and the nori on the inside, was an innovation designed to appease customers who balked at the notion of eating seaweed at a time when sushi was amongst the most exotic of foods. You’re probably not too surprised by the fact that California Rolls weren’t created in Japan, but did you know that rolls in general aren’t especially popular in Japan. Known as makisushi (rolled sushi), most sushi restaurants in Japan only serve a handful of simple rolls, such as kappa maki (cucumber), tekka maki (tuna), or takuan maki(yellow pickle). For many, they’re considered an inexpensive filler reserved for the end of a meal when you start to worry about the escalating bill. I love the fact that we have a much broader selection of rolls in the US. Sadly, many places seem to think that California Rolls are made with mushy cloyingly sweet rice and cheap imitation crab smothered in mayonnaise. Having grown up in the Golden State, I’ve had more than my fair share of these abominations, but when they’re done justice, with fresh crab and ripe creamy avocado rolled in a glistening layer of well seasoned rice, California Rolls can be a real testament to the deliciousness of inauthenticity. To make this, you’ll need to make a batch of sushi rice first. 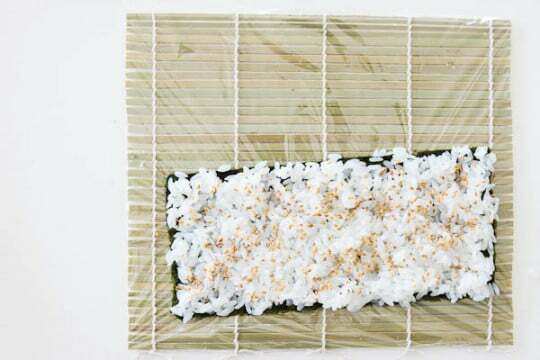 Because a California Roll gets rolled inside out, you need to cover your makisu (bamboo mat) with plastic wrap to keep the rice from sticking to the mat. You'll also want to prepare a small bowl of water to dip your fingers in to keep the rice from sticking to them. 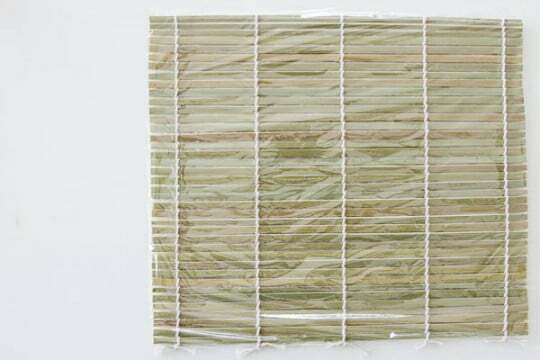 Carefully fold your nori in half, if the nori is fresh, it should split in half along the fold to give you two 3.75 inch x 8 inch pieces. If your nori is stale and refusing to split, you can toast it by gently waving it over an open flame, or simply use a pair of scissors. 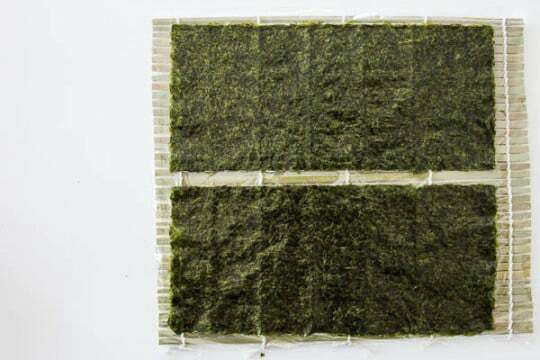 Lay one sheet of nori towards the bottom of the mat. Lightly wet your fingers in the bowl of water and top with a small amount of rice. 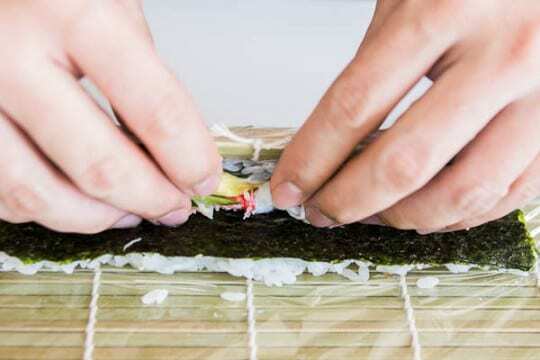 Making sure your fingers are moist to prevent the rice from sticking, use your fingertips to gently spread the rice out to the edges of the nori in a thin even layer. Don't use too much pressure, or you'll end up with mushy rice. Sprinkle the rice with sesame seeds, then flip the rice and nori over so that the rice is on the bottom and the nori is facing up. Along the bottom edge of the nori, put a few strips of cucumber down, followed by a few strips of avocado. 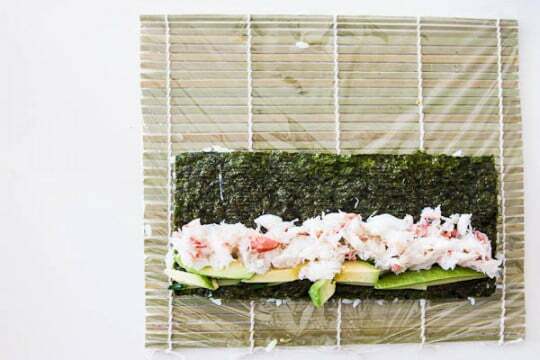 Finish, by spreading some crabmeat across the roll. Be careful not to add too much filling or your roll won't seal properly. 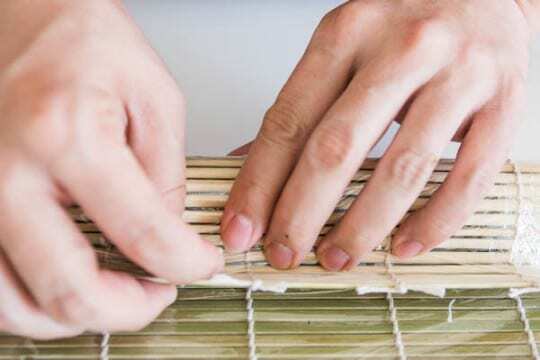 To roll, tuck your thumbs under the bamboo mat and use them to lift the mat and rice over the filling, while using the rest of your fingers to hold the filling in place. 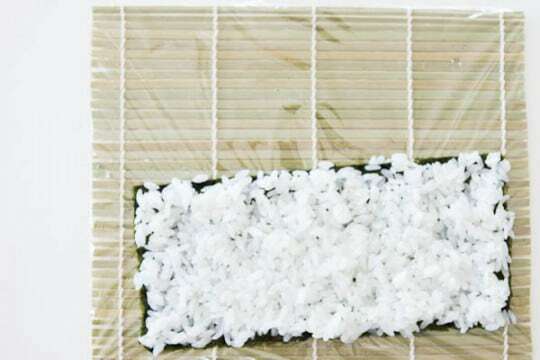 Use the mat to continue rolling the rice over the filling until the rice hits the nori. At this point you'll probably need to start pealing the mat back away as you continue to roll, otherwise you'll end up rolling the mat into the rice. Once, the rice has been completely rolled into a cylinder. Give the matt a firm hug with your fingers to compress the rice a little so it doesn't fall apart when you cut it. If you're not going to eat the roll right away, wrap it in plastic wrap until you are ready to eat your California Roll. Putting the rolls in the refrigerator will make the rice hard and is not recommended, but if it's going to be more than an hour before you're going to eat the roll, you should put it in the fridge to keep the crab from spoiling. To slice the rolls, use a long sharp knife, and place the back edge of the blade at the very center of the roll. Pull the knife towards you, letting the weight of the knife cut through the roll. If put pressure on the knife, it will squish the roll and the filling will come out. Repeat cutting each half into thirds to make 6 pieces of sushi. Serve your California roll with soy sauce and wasabi. I like it all, maki, nigiri. As long as it has the best ingredients( no imitation crab,or frozen tuna), I am happy. Great information and step by step instruction. I am very inspired! Thanks for explaining the history behind the California roll Marc…and thank you for the detailed instructions on how to make them. They do many versions here in Australia too…a favourite being tempura style vegetables in the roll!! Interesting! How very beautiful! I suspect that I’ve never had a California roll as good as the one you have made here, despite a childhood in California. Nice step by step tutorial! I haven’t really had a craving for sushi in forever but all of a sudden I do…I actually love the taste of the rice, I could eat sushi rice with its sugary vinegar seasoning by the bowlful and have done! I think we are having an increasingly wider choice of maki-zushi here, many of them inspired by California Rolls. Though not as big as regular nigiri-zushi, of course. yes I have to agree with you east coast is not so good w/ cali rolls. but my love for uni runs deep. used to eat uni fresh from the ocean in maine. I applaud your effort. It looks easier than it really is (to me, at least). Eating is probably the easiest part! 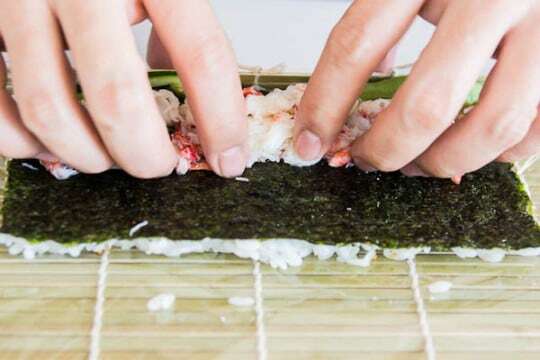 Do you cover the rice and tobiko with a layer of clingfilm before you flip it? Great instructions Marc! Love the step by step tutorial. Are nigiri next? I cheer you for using REAL crab in your California roll. Nothing I hate more than the fake stuff in it. Just such a disappointment. Sigh. interesting about the kombu – i never knew. There is an art to trashy California rolls. love em. i love all kinds of sushi even the really crazy makizushi things that are being whipped up in popular chain restaurants these days. i must say my favourite is inarizushi – i just love anything soy; and otoro sushi 😀 yum yum. this california roll looks damn fine. it’s my sister’s favourite in fact! she’d be in heaven if she saw this. This is quite thoughtful and thorough teaching of making uramaki & its origin, Marc. Thanks! awesome tutorial and info! I’m a big fan of octopus, shashimi or anything octopus. Squid too, yum. Want me more sushi and your rolls, please! a step by step photo tutorial! this may be the first i have seen from you. of course, your photos are beautiful, and you got me craving sushi tonight! Good explanation, Marc. It’s been so long since I’ve done it, now want to try again. And, there’s a good reason for having the nori on the inside. When it’s outside, and you try to bite through, the thing usually falls apart. At least for less nimble types like me. Re your comment about the stoic Japanese guy, one of our local sushi chefs is so beyond stoic, I want to tell jokes and try to cheer him up. He does a good job though. I am more of a roll guy just because the places tend to be way more relaxed and less rigid. Plus saki bombs rule. I use to have a party every now and then that basically buy everything to make rolls or sashimi with. People come over make their own creations but the rule was you could not eat what you made instead had to give it to someone else or throw it in a community plate that people would graze over. Of course the more booze consumed the sloppier we got. Beautiful rolls! California rolls are a total fav. Delish! actually it wasn’t invented in california. It was invented by Tojo in Vancouver BC canada. If you have no bamboo mat, use a mouse pad.